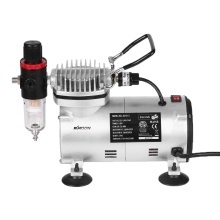 The airbrush compressor is designed for users who need high quality spraying effect. It is perfect for your spray painting art, also for nails & temporary tattoos, cake decorating, craft painting, hobbies, commercial arts, illustrations, photo retouching and other air brushing. So don&apos;t hesitate, just take it home! Powerful 1/6 HP Airbrush Compressor is portable, compact and high-efficient. Features "Air-On-Demand" System that once it has reached its output pressure it shuts off automatically. Precise Air Adjustment Control from pressure regulator with gauge, water trap and air filter. Auto Start and Auto Stop Function: auto stop at 4 bar(58PSI) and auto start at 3bar(43PSI). Maintenance Free: oil-less piston motor, designed with aluminium construction. Thermally Protected Function: turn off automatically when the power over heated. For multiple uses: crafts, fine art, temporary tattoos, cake decorating and more.